Management Quota Scholarship after 12th the meaning of management quota scholarship is direct admission in concerned college and University through entrance exam or merit list in some institute. Many People who don’t wants to give written exam or who live nearest to their college, institute than their parents probably choose that college where they check all types of verification, inspection of children what he or she really doing. 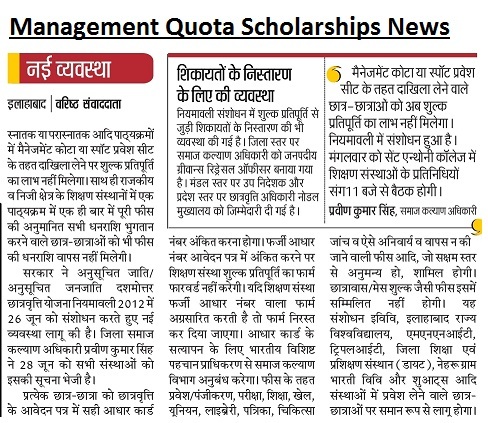 Through other method we say Management quota refers to left seats given to lower cut off marks candidates but it is also rare to get management quota seat in reputed college. Management Quota Scholarship for Graduate Pass: - Many of our friends read in Graduate college of Commerce, Science and Arts stream on local basis because they are preparing for competitive but also attending class when they are free and wants to maintain attendance above 75%. Getting admission with On spot or Management quota many states don’t give them scholarship but if you have shown income below Rs 1 Lakh than you have a bank account that connect Management scholarship link. 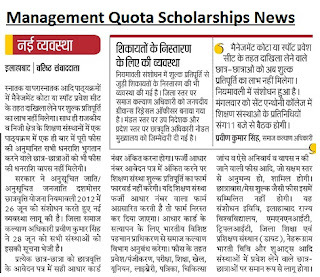 On spot Admission Scholarship For B.A, B.SC, B.com Students we have written about management quota scholarship due to latest news from Uttar Pradesh department of Fees Reimbursement that On spot/Management quota are no longer eligible for scholarship because they have rules and regulation on this. Department of welfare Said in a statement, “On spot admission through management quota in various degree and post graduate are not eligible in scholarship. Direct Admission Scholarship for B.Tech, MBA UP Govt has changed SC ST, 10th (Post Matric) Pass Scholarship Niyamavali 2012 on 26th June 2018. District Social Welfare Officer Pravin Kumar has send information to all Institute, College and University. Management Scholarship For SC ST OBC and Need Based General Students. 1. He further said every student should attached real Aadhar card number to give scholarship on time and if found wrong information related to candidates adhere card than institute will also get warning letter on ban of providing scholarship with benefits. 2. For Verification of Aadhar card Social welfare department tying up with Unique Identification Authority of India. 3. Scholarship fees includes Admission Registration, Exam, Education, Game, Health Verification, Library Books etc paid which cannot be return. 4. Hostel Fees, Mess Charge, Food does not include. 5. Department: - Currently all Central, State University, College and Institute in Uttar Pradesh.